Less than a week after the new term began, Wang Hongjian, who left his hometown and worked in a far-away city for nearly 15 years, decided to quit his job and return to his home village in Yueyang, Central China's Hunan Province. It was not better job opportunities that pulled him back. Rather, it was because that his children are addicted to mobile phone games and "almost completely abandoned their studies." During the whole summer vacation, Wang's two children indulged in video games. His son Wang Yuxuan plays all kinds of games day and night. "A mobile phone with a full battery will run out of power in half a day. Sometimes he even sits next to the socket to charge the phone and play," the father told the China Youth Daily. His daughter is obsessed with Korean dramas, and also binge-watches videos on Douyin, a popular Chinese short video app. Wang Yuxuan told the China Youth Daily that almost everyone in his class has a smartphone. "We are excited to gather for a group online game. We can start one very quickly as soon as we get out of the teacher's sight." The boy's father said that the boy stares at the mobile phone without talking to anyone at all, only taking a break for eating and sleeping. Even if his grandparents confiscate the phone, it won't take him too long to get it back. The boy admitted that during the hot summer vacation, playing games at home has become his favorite activity. What is the appeal of these games? 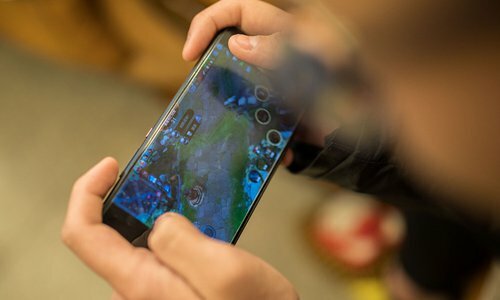 A middle school student from Baisha county, East China's Guangdong Province, explained that real life feels dull and boring compared to the excitement of online games. The China Internet Network Information Center (CNNIC) has released multiple survey reports on Chinese teenagers' online behavior. In 2015, the number of young Internet users reached 287 million, of which 27.6 percent were from rural areas. Statistics show that the average weekly time spent online by teenagers is 26 hours. With the popularity of smartphones, these figures are still on the rise. "Where have all the children gone? They are going into the phones," Luo Dahong, a migrant worker from Jinzhai county, East China's Anhui Province, sighed. He told the China Youth Daily that the village was very lively in the past because children were all playing outdoors during summer vacations. But now very few can be seen frolicking on the roads. "Many youngsters are increasingly content to stay in a corner, staring at their phones without saying a word," he said, frustrated by the current situation. Online games are gradually engulfing the countryside. A large number of rural teenagers are immersed in them. Not only do the teens have no self-discipline, they consider playing games to be the "in" thing to do. Parents and experts worry that rural children are being devastated by mobile games. In Guan village, Guangdong Province, several shops and kiosks that offer Wi-Fi are surrounded by children. The youngsters are not deterred by the scorching summer weather of South China. Yang Xiaolong, a junior high-school student from Hebei, said his classmates usually hide their phones in the toilet or shoes when they encounter a surprise inspection. Yang's dorm doesn't have a charging jack, so they often "buy electricity" at a small shop nearby, paying two yuan to fully recharge their phones. Liu Chengliang, a researcher at the Huazhong University of Science and Technology, found during his research trip to a poor county in Chuxiong Yi Autonomous Prefecture, Southwest China's Yunnan Province, that some shops around rural schools sell not only electricity but also mobile phones. Students can buy a mobile phone on credit and pay for it in installments with their living expenses. "There is a huge market for students to buy phones on credit, and most of them get phones from the shop secretly," he said. Sun Aiying, Yang Xiaolong's mother, who works in a far-away city, said the original intention of buying a mobile phone for her son was to keep in touch with her while he was away from home. Also, she felt indebted to her son because they are separated. Unexpectedly, her coddling led to a sharp drop in his academic achievements. "I go back to see my child every three or four months when I work in the city. His grandparents cannot control him, but I did not really want to beat and scold my son." After investigating several schools in six counties and cities in Guangxi and Yunnan, Liu Chengliang found that it became common for rural children to have a mobile phone. "'King's Glory' became their favorite game. They can't stop playing it." Liu found that most young parents are not able to supervise their children when they go to a bigger city to find work, and grandparents do not pay enough attention to this problem due to factors such as a generation gap. A survey and report on adolescent online addictive behavior in 2017 and 2018 by the Ministry of Education shows that children whose parents are in different cities working apparently spent more time on online games than children whose parents are home. Zhang Haibo, the director of the children media literacy education research center of the China National Youth Palace Association, believes that unlike urban parents, rural parents are restricted by factors such as education level, and fail to truly realize the harm from letting children freely play video games. Poor long-term supervision, a lack of family affection, inadequate education and undisciplined living habits have left these so-called "left-behind children" labeled as "problematic teenagers." A left-behind child from Jinhu, Jiangsu Province, once left a note to a volunteer who came to support her school by bringing supplies, writing, "I don't like what you brought. I want a phone that can play King's Glory." For rural children, the lure of mobile phone gaming directly saps the motivation to learn. Liu Sumei, a middle-school teacher in Wenxian county, Central China's Henan Province, suggests that some students living in the school often lie under a quilt to play mobile phone games or watch live-stream videos. "They have no energy during the day class. And after less than a semester, their grades plummeted," Liu told the China Youth Daily. "The biggest responsibility for gaming lies not with the children themselves, but with their guardians, peer groups, schools and society," said Fan Yongkun, a professor at Northeast Normal University. He has long studied left-behind children, and says addicted teens should not be criticized blindly. Rather, parents need to reflect on their overall situation. Fan suggested that rural schools should adopt different methods for different ages to prevent children from indulging in mobile phones. Children in kindergartens and primary schools generally care about their teachers' attitudes. Teachers need to integrate internet education into daily teaching, and make more rigid rules. Middle school students care more about the influence of peer groups, so harnessing the power of peer pressure may be more effective. He suggested that primary and middle-school teachers should learn and master the concepts and method of internet literacy education to better guide students to use mobile phones wisely. However, many rural teachers still have weak awareness of this aspect. Zhang Haibo suggests that the government should take measures in the grading and classifying different games. Enterprises that develop online games should also shoulder their social responsibilities, such as strengthening the offline identification process and limiting game time to prevent underage addiction. "Solving the problem of children indulging in games in rural areas needs the joint efforts of the government, enterprises, society and educators," he said.